Which Holder Do I Need? Use these simple steps to make certain that you are getting the right 'offset' on your plate holder. The offset is the most important thing in deciding which holder to use. The plate holder is fixed by slipping it behind the number plate. You first take off the number plate and then position the holder behind it, ( although Mogo say you don't need to, we sometimes use a piece of double sided tape as a double fixing between the plate holder and the number plate as some number plates are a bit bowed in the middle). The number plate is then fixed back on the vehicle pinching the holder behind it. Mogo have a range of plate holders which cover some sizes of licence plates but because there are so many shapes and sizes used in the UK, many people will find that the plate size and shape they have will not match up to any holder. In this case, we make certain that we fit the holder with the correct 'off set' and although the half of the Mogo bracket holding the plate could be the wrong shape or size, normally smaller, we then use 'double sided tape' to fix the licence plate onto the plate holder. First decide whether you want your plate to sit above, below or to the side of your number plate. The plate holders that hold the plate to the side are not very strong in our mind and tend to flap around a bit, so its best to be below or above the number plate if possible. Make certain it will not be obstructing anything. The next step is to measure the 'off set' from the number plate to the position you want the licence plate to be in. Move the plate towards the vehicle body, checking that it is not making contact with the body. Try and keep the off set to as small as you can as this will reduce any movement in the holder. If the plate is going to just touch or knock, say the bumper when you shut the boot, you can place a small piece of foam on the back of the plate so it doesn't damage the bodywork. As the bracket is going to sit behind the number plate, the offset measurement should be taken from that point. Once you have decided where your plate is to go and measured the off-set, your next step is to choose the plate holder. These are the various Mogo Holders and the off set they give you. 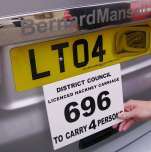 This is the most common holder that can be used above or below the number plate. It has an off set of 45mm. The Euro has a smaller offset of 15mm. 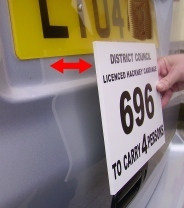 The holder can be used for above or below the number plate fixing. The Ua1 is an adjustable plate holder that can be used above or below the number plate. It uses two clamping screws to make the adjustment. It has an offset range of 55mm to 85mm. This holder is for left or right side mounted plates. We find these are a little floppy but they do work. Do not use these if you can mount above or below the number plate as this will give you a better & firmer fixing. This plate holder is designed mainly for front mounting licence plates. 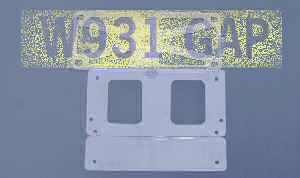 It can be used above or below the number plate.